Research is at the heart of Sussex, where research centres are international leaders in their fields, and an interdisciplinary environment thrives across the university. Sussex research has produced Nobel prizes, developed radical theories, and created important innovations. It has had extensive impact on business, government, the third sector, health and culture. Over 75% of Sussex research was categorised as world leading or internationally excellent in the latest Research Excellence Framework. 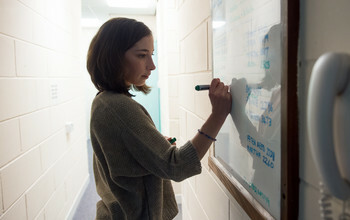 Sussex History was rated as the UK’s top history department for its research outputs by REF2014, Sussex Geography had the most top-quality impact of any UK Geography department, and Psychology, Biological Sciences, International Relations, Anthropology, Politics, English, and Media and Film all received top-15 results.